May 5, 1949 - July 10, 2003 Son on the late Karl E. and Marion MacKinnon Israelson. He helped his father operate the Union City Dry Cleaners before he purchased the business and ran it for several years. He moved to Erie where he owned and operated Top Hat Leather, specializing in leather goods and muzzleloader supplies. He was an avid Harley-Davidson fan and owned a bike. He played drums in the band, "The Trolls", in the late 1960's. 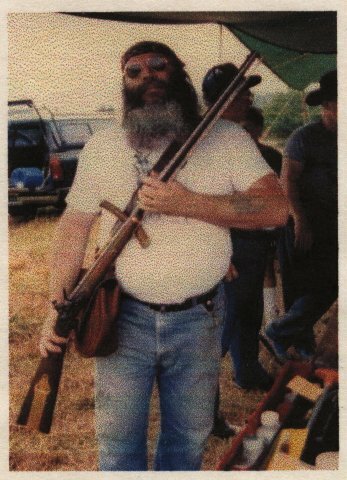 He was a member of the Fort Erie Muzzleloaders, The Pennsylvania Leather Guild, The Loyal Order of the Moose, Lodge No. 882 in Union City, and The East Erie Turners. He also volunteered his time and many hours to the Pennsylvania Soldiers and Sailors Home in Erie. He was preceded in death by two aunts, Florence MacKinnon and Marie Rathburn, and an uncle, H. Larue Israelson. Survivors include his wife, Carol Murphy Israelson of Erie, and daughter, Barbara, and Son David. Also two aunts, Martha Pagliare and Mary Israelson as well as several cousins. Our friend and brother was buried the Evergreen Cemetery in Union City.